K25-XD system, Geminate region. 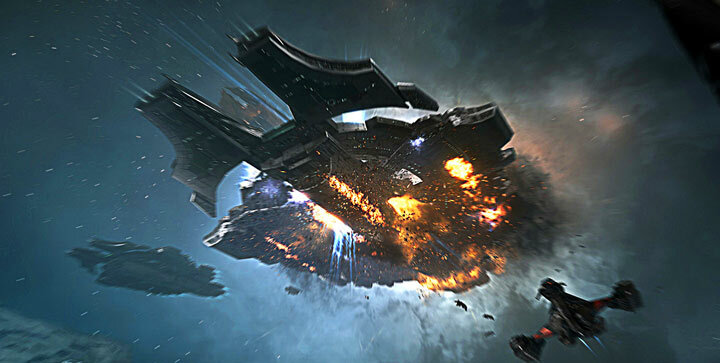 On the 7th of December at 18:14 EVE Standard Time a battle unfolded in the system which led to the destruction of a Drone Regions Federation (DRF) Nyx super carrier and its supporting fleet. The battle was a result of a well planned trap set up by Scourge. [URGE.] and Project.Mayhem. [16-13]. Scourge. is no stranger to the drone regions and in one of its roams stumbled upon a mining operation in progress in the system. However, local forces quickly responded, warping in carriers and force auxiliaries. With such an overwhelming show of force, Scourge. could do very little but retreat. After the incident, Scourge. contacted Project.Mayhem., one of the alliances living in proximity to the area and well known for battling the DRF. Project.Mayhem. dispatched scouts to the system to keep eyes and gather intel. The locals didn’t even seem to mind the enemy scouts, going on with their usual activities such as mining and ratting without worry. Reporting on this, especially on the number of Rorqual capital industrial ships which were in abundance, Project.Mayhem. fleet commanders saw a chance for a daring raid. Together with Scourge., they formulated a plan to trap both the Rorquals and their would-be saviors, as well as provoke an escalation from the DRF. With the system often jammed, Project.Mayhem. and Scourge. set up cynosural beacons in a neighboring system and moved a titan in range. The titan was also in range of the target system in the hopes that the system’s cynosural jammer would be taken down by the defenders in order to bring in reinforcements. 20 dreadnoughts were also prepared and a 110 pilot Proteus strategic cruiser fleet assembled. Scourge. took the role of bait, organizing a small gang comprised of fast moving ships such as the Vexor Navy Issue cruiser. It also had a couple of dreadnoughts in reserve, prepared to come in and force an escalation. Once everything was in place, the Scourge. gang traveled to the system. Entering the system, it warped straight to the belt where a mining operation was taking place. Within moments, the entire fleet of Rorquals and Hulk Exhumers was pinned down by warp disruption probes. Not waiting, Scourge. started bringing in its capitals while its sub capitals busied themselves with eliminating the Hulks. The local defense force responded, and a Ninazu force auxiliary with several carriers warped in. However the nimble cruisers with their logistics proved much too hard a target to hit, even by the carriers’ fighters. The fight escalated as the Scourge. capitals arrived on grid. Without pause, the dreadnoughts entered their siege cycles and opened fire on the Ninazu, which quickly buckled under their firepower and caved in. With the Ninazu gone, an Archon carrier was chosen as the dreadnoughts’ next target. The Scourge. Naglfar dreadnoughts started bombarding the ship, taking it down without much trouble. By then, members of the DRF started responding. First in was a small gang of Cerberus heavy assault cruisers. The fleet, estimated at less than 20 pilots, arrived in the system and warped in, joining the fight. The heavy assault cruisers kept their distance from the Scourge. fleet, unleashing swarms of light missiles. The Scourge. fleet was unimpressed and managed to tank the damage for a long time while inflicting more casualties on its enemies. As this was going on, more DRF forces organized to help the tackled Rorquals. A 90 pilot Proteus fleet quickly assembled which included many capitals and a Nyx. The force prepared to bridge into the system, forcing one of the defenders to warp to the tower containing the cynosural jammer and cycling it down. With the jammer down, DRF forces secured a cynosural beacon on the field and lit it up. A second later, strategic cruisers and capital ships materialized on the grid and prepared to join the fight. This did not escape the Project.Mayhem. scouts. So far its fleet kept its position on the titan, waiting anxiously to jump in and join the fray. However its fleet commanders kept holding it back, hoping for a greater escalation. With the report of the large Proteus fleet, including 2 dozen carriers and a Nyx to boot, Project.Mayhem. fleet commanders got what they wished for. Without delay, the call was made for a cynosural beacon to light up near the Nyx. With the jammer down, the Project.Mayhem. Proteus fleet was able to bridge in to the fight itself. The DRF fleet was caught by surprise. Project.Mayhem. interdictors wasted no time in trapping as many of the carriers as possible. Heavy interdictors raced ahead to secure tackle on the Nyx. With confirmations ringing on comms, Project.Mayhem. brought in its dreadnoughts, 2 full squadrons of them. The capitals landed on grid near the Nyx, entered their siege cycles and opened fire. Their first target was not the Nyx itself, but rather the Apostle force auxiliaries in the DRF fleet. With their capital remote armor repairers taken out, the Nyx itself would be easy prey for the dreadnoughts. One by one, the Apostles were destroyed, overwhelmed by the devastating firepower exhibited by Project.Mayhem.. The sub capitals added their firepower to the mix, determined to hasten the fall of the force auxiliaries. The DRF responded, targeting the dreadnoughts and attempting to remove as many of them as possible. If Project.Mayhem. succeeded in taking the Apostles down, the DRF capital fleet, including the Nyx would be in trouble. If the DRF succeeded in removing enough dreadnoughts in time for a couple to survive, it could in turn slaughter the Project.Mayhem. force. The race was on. The battle went back and forth, each Apostle destroyed done so at the price of a dreadnought. However Project.Mayhem. had 20 dreadnoughts, and the DRF had only 4 Apostles. In a couple of minutes, the logistics backbone of the DRF fleet was annihilated. With the Apostles gone, the first target of the dreadnoughts was the Nyx. Barrage after barrage tore into the super carrier, chewing through its armor. Once most of the armor had been stripped away, the super structure of the ship came under attack. The unarmored sections could offer little resistance to the torrent of munitions poured on the ship and caved in quickly. After a minute, the ship lost power as its reactors shut down before being ripped apart in a series of explosions. The blast ruptured the perforated hull of the ship, flinging debris everywhere. Finally, the behemoth came to rest, its remains twisted into huge chunks that floated silently in space. The death of the Nyx did not signal the end of the battle. DRF forces continued to fight, trying to destroy as many dreadnoughts as possible while clearing out interdictors. Project.Mayhem. put its sights on the DRF dreadnoughts, its ships switching targets and relentlessly firing on each until their demise. One after another the DRF dreadnoughts were dispatched, removing another chunk of DRF firepower from the field. With the dreadnoughts removed, Project.Mayhem. decided to split its focus, allowing the dreadnoughts to keep pummeling the DRF capitals while its sub capitals concentrated on the DRF Proteus fleet. Rail guns and beam laser batteries swiveled fast, attempting to keep track of the smaller, nimbler strategic cruisers. super heated plasma charges burnt through armor plating while laser beams cut their way into the hulls below. Within moments, DRF Proteus and Legion strategic cruisers started exploding, the Project.Mayhem. fleet easily overwhelming them. All the while, the Project.Mayhem. dreadnoughts continued trading blows with the remaining DRF dreadnoughts. The two sides exchanged furious attacks, with Project.Mayhem. suffering more capital losses but inflicting far worse on its enemies. As the battle raged on, a new fleet arrived on grid. Out of Sight. [OOS] had a small Machariel battleship fleet, estimated at 50 pilots, roaming the area. The fleet had attempted to provoke a fight from the DRF in its staging system of BWF-ZZ. The DRF did not answer the challenge though, as its forces were embroiled in the fierce battle developing in K25-XD. With the news of the fight and the tackled Nyx reaching Out of Sight.’s fleet commanders, the force decided to make best speed to K25-XD and join in. Upon arriving to the system, the fleet was too late to join in on the Nyx. However, the DRF still had multiple juicy capitals tackled and a Proteus fleet on grid. Deciding to join the fight, Out of Sight. sided with Project.Mayhem., its battleships landing at a distance from the fight and opening fire on the DRF’s strategic cruisers. With the Machariels concentrating on their enemies, Project.Mayhem. fleet commanders ignored the newcomers, keeping their focus on the hostile Proteus fleet. The DRF fleet found itself outnumbered and outgunned, unable to break the tank of its counterpart. Instead, it did the only thing possible and attempted to clear as much tackle from the grid as possible, in the hopes of freeing as many capitals as possible. In rapid succession, DRF strategic cruisers were destroyed, every minute seeing the demise of 3,4 sometimes 5 of the ships. DRF capitals that could get out of the cover of warp disruption probes or were not tackled by interceptors and heavy interdictors used the opportunity and warped out, some making emergency jumps out of the system and to safety. Project.Mayhem. itself was busy extracting its dreadnoughts, having served their initial purpose and with the enemy capitals burning out of optimal range of their guns had little use. The DRF Cerberus fleet also came back into focus. It had skirted the fight, adding its firepower but escaping notice. With the grid slowly clearing of DRF forces, either as they retreated or more often cut down by the attackers, it came back into Project.Mayhem.’s crosshairs. The heavy assault cruisers proved no match for the combined might of the battleships and strategic cruisers and were destroyed with ease. Volley after volley saw a Cerberus’ shields disappear only moments before its hull. Since the Nyx’s death the battle had raged for 20 minutes, but by that point most of the DRF’s fleet was destroyed. The remaining ships were dispatched with ease and the attackers switched their focus again, this time to destroying the remaining capitals still tackled on the field. Carriers, dreadnoughts and even one surviving Apostle were all cut down by Project.Mayhem. and Out of Sight., with the Scourge. gang aiding with what remaining firepower it possessed, having taken some losses in the fight. As the fleets continued their mop up operation, the fleet commanders had noticed that in the commotion the Rorquals managed to escape the slaughter. While a minor victory for the DRF, the price in capitals and sub capitals was more than enough for the attackers. As the last capitals were brought down, the 3 alliances started looting the field, salvaging anything of value and destroying any equipment marooned in space. Finally, with the last DRF ship destroyed and the field held triumphantly by the attackers, Project.Mayhem., Out of Sight. and Scourge. extracted their fleets, ending the fight. Battle report for the K25-XD system can be found here. All told the battle lasted a full hour, with Time Dilation not reported by any of the combatants and the system hosting an estimated 400 pilots at the peak of the fighting. Most of the ships destroyed in the battle belonged to the DRF, 118 in total including 1 super carrier, 9 dreadnoughts, 6 force auxiliaries, 8 carriers and 26 strategic cruisers, bringing the total sum of ISK destroyed for the DRF to 131.47 billion. Project.Mayhem., Out of Sight. and Scourge. had lost only 31 ships in comparison, including 11 dreadnoughts and 1 carrier for 38.51 billion ISK damage. Tags Drone Regions Federation Geminate K25-XD Legion of xXDEATHXx Out of Sight. Project Mayhem Scourge. Hello! I just wish to give you a huge thumbs up for your great info you’ve got here on this post. I’ll be coming back to your site for more soon. kLmX08 Therefore that as why this piece of writing is outstdanding. Is there a site that makes it easy to follow blogs and also podcasts? I don’t have an iPod, does that issue?. What is a blog site topic that you would locate interesting to review? I’m looking for some really excellent business blog sites to include in my google visitor that are beneficial adhering to on an ongoing basis. Can you make and recommendations? I have Seth Godin’s currently. Thanks!. It would also be useful if you told me why you liked these blogs. TxWXPy Wow, great blog post.Much thanks again. Great. Do you blog? Do you blog to market products you are selling? I am rather new to the blogging world. I generally blog to advertise items that I am selling and internet sites that I am marketing on. Exactly how do I obtain website traffic to my blog site? Do I essentially just need to add web content? Does my blog site obtain picked up in the search? Any kind of advice on blogging is very much needed. Hey there, yes I discuss it on my twitter account and also my various other web-sites. I have three blog sites on tumblr under the very same email address. Just how do I erase among those blog sites without deleting the various other two?. Preferably, I ‘d like someone to answer whom has actually experienced this issue prior to and also solved it without removing their various other blog sites. Thanks!. What holding websites will allow my blog site to make money off adds being positioned on my blog site?